Finding Grace in Nature: Guy Tal's New eBook is Impressive! Guy Tal's New eBook is Impressive! I love black & white images. They evoke so much emotion and I generally react to them more profoundly than color images. When I see a beautiful monochromatic picture, I am moved deeply and the image stays with me; I think about it over and over and I want to remember it always. I had this reaction to many images I recently saw at an exhibit of Edward Weston’s and I decided it was time to jump back into the black and white (B&W) end of the photographic spectrum. After I got home I headed to the computer to see what magic I could create. I opened some files that had all the technical components that could make a beautiful B&W image: Clouds? Check. Texture? Check. Lines? Check. Focus point? Check. I hit the conversion button in Lightroom/Photoshop/SilverEfex Pro … and … bammo! A monochrome image! Yep. That’s what it was, but it had none of the impact I had seen in other images. There was no color, but there was also no emotional reaction. What gives? My image was not memorable because it did not incite a reaction of any kind and simply pressing a preset conversion button was not the answer. Sound familiar? This is where Guy Tal’s latest eBook, Creative B&W Processing Techniques comes in. If you have ever liked, thought about, attempted, or successfully produced a black and white (B&W) image, this book is for you. In his eBook, Tal takes us on an educational journey from image conception to final output. More than a step-by-step formula to make a monochromatic image, this book offers the tools to visualize a B&W image and understand the process of maximizing it to reflect your unique vision. He challenges the reader to think about B&W as an in-field decision to express an emotion that cannot be conveyed in color and to make a connection with the scene to create a more personal image. Tal encourages the reader to make an active choice to press the shutter with a concept in mind that will be rendered into a compelling image. He helps hone the creative process with instruction on visual storytelling as well as adjustments in the digital workflow. The use of exercises to break down the lessons into manageable pieces helps the reader internalize each section before moving on. By the end of the book, the photographer is ready to put these lessons into practice and decide what works best for them and their images. The book takes you seamlessly through developing the concept, visualization and composition, capture, RAW conversion, and processing for successful B&W images. It is a companion to Guy Tal’s earlier eBook, Creative ProcessingTechniques, and assumes familiarity with basic functions of Lightroom and Photoshop. His focus in this book is on the techniques specifically necessary for producing B&W images. He explains in technical detail how the camera and computer capture and convert RAW data to assist the photographer in making processing decisions and organizing the workflow in a way that enhances the B&W image and does not impact a color image. For me, there are many enlightening parts of this book. The technical descriptions of how the camera records RAW data and how the software uses this data differently with monochrome versus color images is invaluable for understanding how my processing decisions can inadvertently impact my final image. I am more aware of how to preserve all data recorded to create the best image possible. I also more fully recognize what happens in the RAW conversion process and how the processing adjustments I make at that stage are completely different than what I do for color images. I now know the why behind these decisions and I am more likely to remember them! The global and local adjustments Tal uses will undoubtedly advance most photographers processing skills. I confess that I am a mere mortal when it comes to Photoshop and can do enough to get by, but I am not fluent in Photoshop-ese, by any means. That being said, I could easily follow and employ all the adjustments discussed and fully understand their effects. 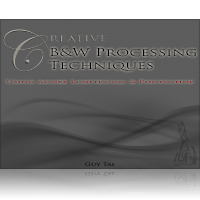 If you are unsure about your processing skills and haven’t ventured far into Photoshop layers or masks, you may want to start with Guy Tal’s eBook, Creative Processing Techniques, as this is a companion book and goes over many of the worthwhile functions in Photoshop. Creative B&W ProcessingTechniques discusses the thought process and techniques for creating beautiful black and white images. I can see myself returning to this book repeatedly to visit the techniques used, solve problems that come up in processing, and to find inspiration for development of my creative vision. I feel empowered to use the processing techniques to fulfill my vision instead of “letting the tools drive the way an image is processed (page 49).” It is an excellent addition to my photography resource collection! I highly recommend this book as a useful tool for any photographer looking to enhance their creativity and learn new processing techniques. Excellent review - I know Guy's work well and have most of his other eBooks too. Sure to be another great addition to the learning collection. Thank you so much, Alister!